Constructivism was an artistic and architectural philosophy that originated in Russia beginning in 1919, which was a rejection of the idea of autonomous art. The movement was in favour of art as a practice for social purposes. Constructivism had a great effect on modern art movements of the 20th century, influencing major trends such as Bauhaus and the De Stijl movement. Its influence was pervasive, with major impacts upon architecture, graphic and industrial design, theatre, film, dance, fashion and to some extent music. Draw the largest circle the paper will allow with the compass. Draw several circles inside the big circle. Create distortions by drawing at least three circles close together. Have at least three distortions in the picture. Use the protractor to mark off each half and whole degree. Mark all the way around the circle by turning the protractor upside down. Draw lines using pencil and ruler from the center through the mark and out to the last circle. Fill in the blocks created with pen and ink in checker board fashion. Color in white sections in a contrasting color, or leave white. 1. Draw parallel lines in horizontal position with the same space between them. 2. Draw parallel lines in vertical position and change the space between them by diminishing it and, after a while, increase the empty space. 3. Fill in the blocks with black felt pen. 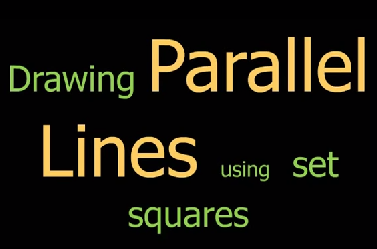 Let us revise how to draw parallel lines using the triangular set squares. You have made a good effort! Watch the woks you have done. Some of them are really good! On friday we were talking about Op Art, I would like you to see this presentation. Do you understand Op Art better now?